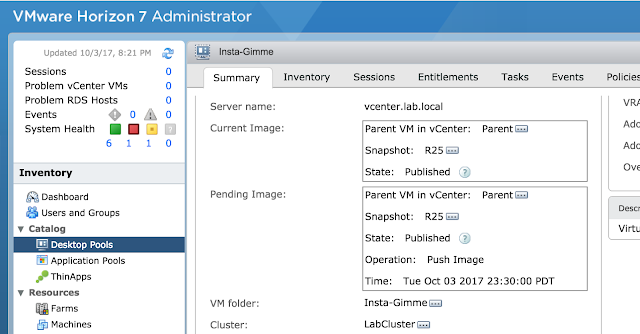 This post will demonstrate a very meaningful integration between Horizon Apps and vRealize Operations using PowerCLI. Using Horizon App's customizable load balancing process, its possible to leverage the metrics and analytics of vROPs to intelligently guide the placement of new RDSH sessions within a Horizon Apps farm. Load balancing priority of any given RDSH VM can take into consideration the entire vSphere stack supporting that VM, the servers, the storage the networking, etc.. and is not limited to one or two key metrics. With real time data pulled from vROPs determining the placement of new sessions in a farm, we gain the benefit of an automated response to impacted infrastructure. Not only can we divert sessions away from suspect hardware, but we can also actively guide and shape workloads across our infrastructure based on the in depth visibility vROPs provides. This potential will be demonstrated with a slightly modified vbscript and powershell script. The proposed solution starts with making slight modifications to the sample load balancing script, cpuutilization.vbs, provided by VMware. 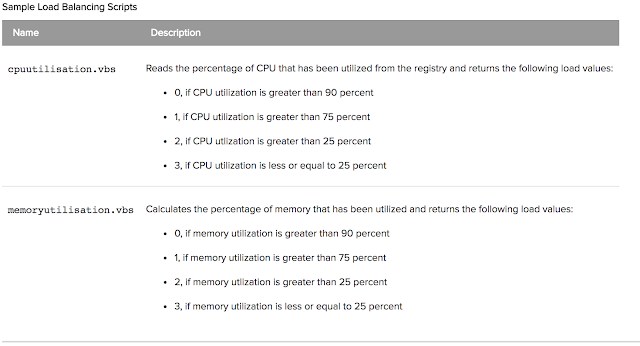 Normally this script determines the load balancing priority of a given RDS host based on cpu utilization. Sticking with the basic structure of this script we can further refine the process for determining load balancing priority to include vROPs information about the underlying infrastructure. For this demo in particular, the Health, Workload and Capacity_Remaining badges, or super metrics, of the underlying ESXi hosts will be utilized. To keep requirements simple on the RDSH VMs themselves, information from vROPs will be relayed to the modified cpuutillization.vbs script via the existence of text files in a remote share. These text files will be put into place when a PowerCLI script running from an administrative system determines that at vSphere hosts associated with a particular RDSH VM has potential health or capacity issues. The cpuutilizlation.vbs will in turn lower the load balancing priority of RDSH VM based on the detection of the text file. The modified cpuutillization.vbs script can be found here at the bottom of this post. The PowerCLI script that detects problems with underlying ESXi hosts and creates text files accordingly can be found at the bottom of this post as well. To use these in your own environment replace the server names, user names and passwords with those from your own environment and give it a go. If you want a more in depth explanation on how the process works, just continue reading. With the sample scripts cpuutilization.vbs and memoryutilization.vbs, higher or lower priority is provided to a RDS host based on cpu or memory usage. For example, with the cpuutilization.vbs script, hosts with CPU utilization of 90% or higher are given a load preference of block, with an exit code of 0, while host with low CPU utilization under 25% are given high preference with an exit code of 3. For this demo, the cpuutilization.vbs has been modified to adjust load preference according to both CPU utilization and any health or capacity warnings obtained from vROPs. Essentially, when there's issues reported by vROPs we're taking the normal exit codes of this script and decrementing by 1. So if the script would normally spit out an exit code of 3 based on CPU utilization, but currently has issues according to vROPs, the exit code is going to be decremented to 2. Or if a system already had low preference with an exit code of 1 because of high CPU usage, it will drop down to a load preference of block with an exit code of 0 if issues are detected through vROPs. The PowerCLI script works through a combination of vSphere PowerCLI, Horizon PowerCLI and the PowerCLI module for vROPs. Initially, Horizon PowerCLI is used determine the RDS hosts that are members of the specified RDSH farm. (This is a process I detailed in a previous blog posts that can be viewed here) For each RDSH VM in the farm vSphere PowerCLI is used to obtain the name of the vSphere host the VM is running on. Finally, the PowerCLI module for vROPs is leveraged to obtain super metrics about the ESXi host. Then, with the name of the ESXi host in hand we can use the Get-OMResource cmdlet to obtain relevent info about the ESXi box. Here's an example of how to do that. The object returned by Get-OMResource is chock-full of vROPs information regarding the ESXi host. Here's an example of retrieving badge information about the vSphere host using the returned object stored in $EsxiHealth. For our demo load balancing script we're going to zero in on the Health, Capacity_Remaining and Workload badge. 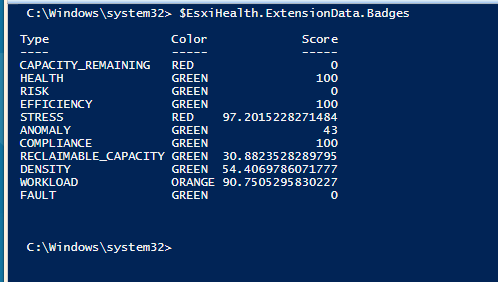 If Health isn't green or Capacity_Remaining or Workload are red a text file is created in the remote share indicating the RDSH VM is sitting on a ESXi box that's suspect. As you can tell from the incredibly professional drawing above choosing to integrate directly with the Connection server spared us the creation of additional firewall rules. Further, it provided us a well traveled path to Symantec VIP integration. Support for RADIUS started with View 5.1 and includes a long list of vendors. Plenty of folks have done it over the years. In regard to Symantec VIP in particular, an integration guide called the Symantec VIP Integration Guide for VMware was put out in 2012. Most of what this guide details still holds true today. Below is an excellent graphic from the guide that illustrates the gist of how the integration works. 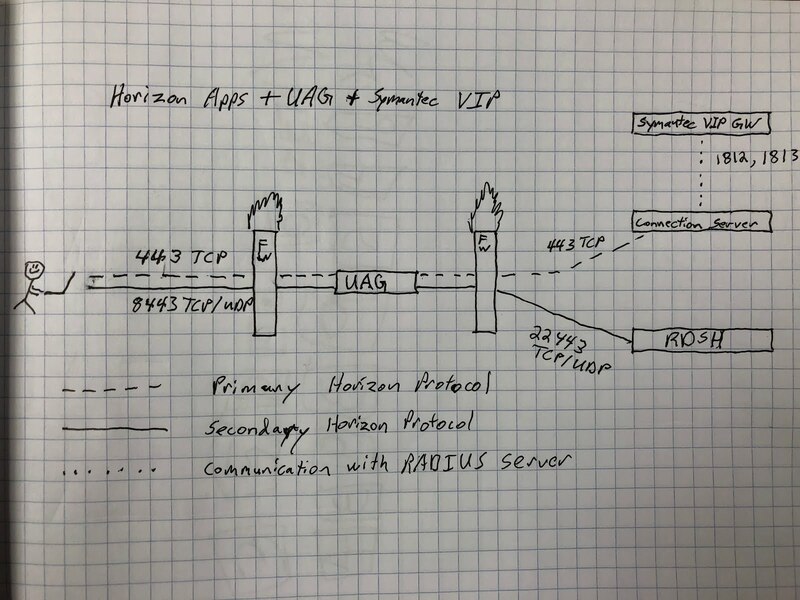 With a validation server setup properly the next step is to configure the Horizon Connection server itself. So navigate to View Configuration > Servers > Connection servers. 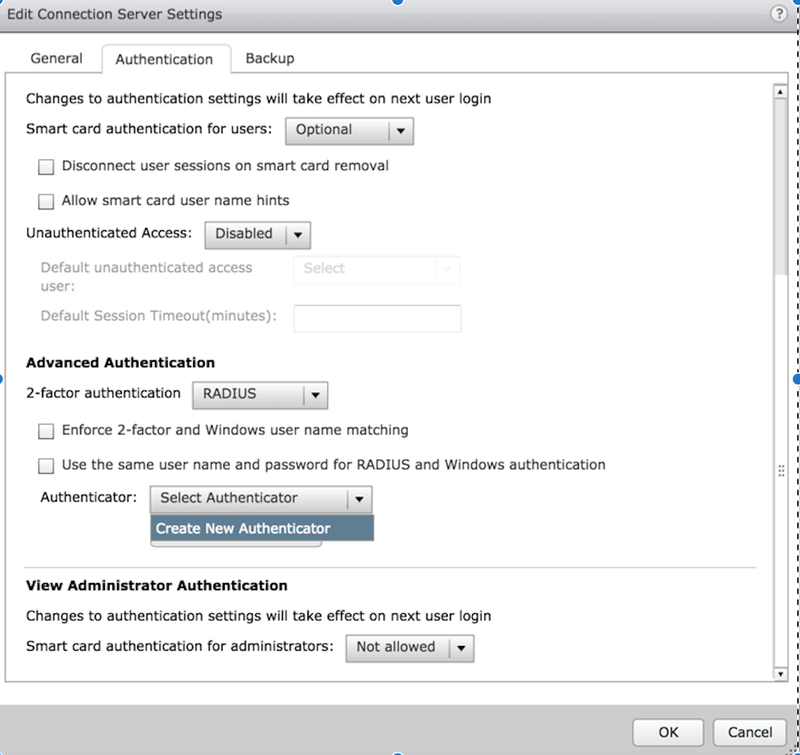 Select the connection server you want to enable 2 factor authentication and navigate to it's authentication tab. 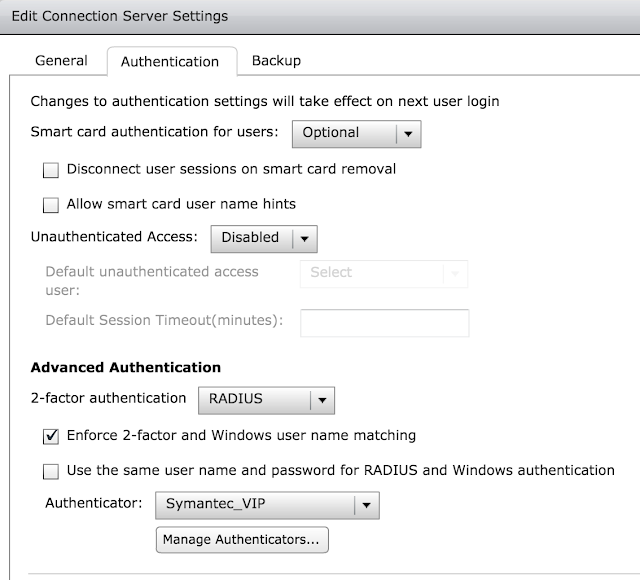 Select RADIUS for your two factor authentication option and select, "Create New Authenticator." Finally, select this new authenticator and check the box, "Enforce 2-factor and Windows user name matching." At this point you should be all set. 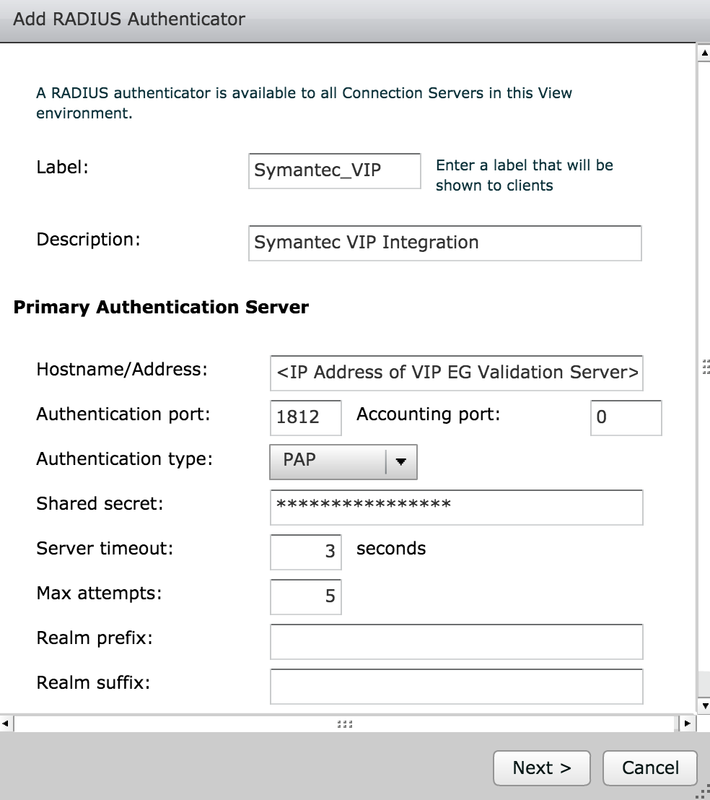 When authenticating to this Connection server - whether directly or through the UAG appliance - you'll first get prompted for your passcode, then your normal AD credentials. However, as of today there isn't a similar view available for Instant Clone farms for RDSH. So I've put together a work around utilizing Horizon PowerCLI and the Active Directory module for PowerShell. Using Horizon PowerCLI you can determine the RDS hosts associated with a specific farm. 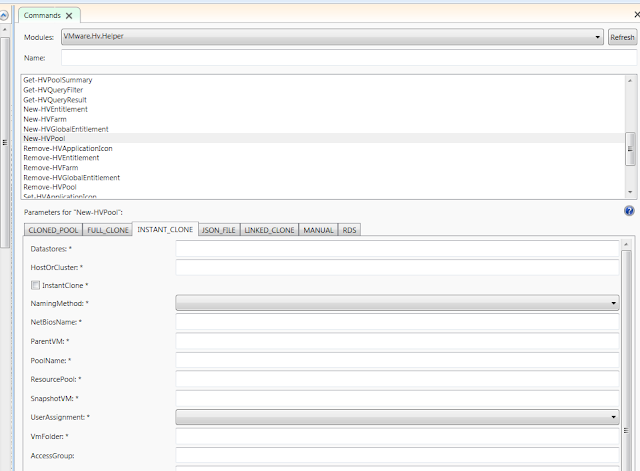 Then, using the Active Directory module, you can connect to View LDAP directory to look up Instant Clone maintenance/image properties from LDAP objects that represent these RDS hosts. This includes info similar to what's seen in the screen shot above. A prerequisite for this script is an OS that's setup properly for Horizon PowerCLI and has the the VMware.Hv.Helper module imported. These blogs by Ray Heffer and Graeme Gordon will get you up to speed with these perquisites. Also, you'll need Active Directory Module for PowerShell, a process that's covered pretty well in this blog. With the above prerequisites lined up you can get started with the script. The entire script is included below along with sample screenshots from it's output. If you just want to take a crack at the script change the variables at the very top of then have at it. Otherwise, here's some details on how it works. First variables are populated with values for farm name and connection server. 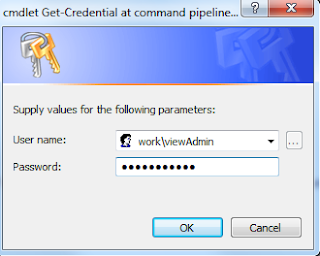 Next, credentials are gathered for access to the Horizon API and View LDAP environment. 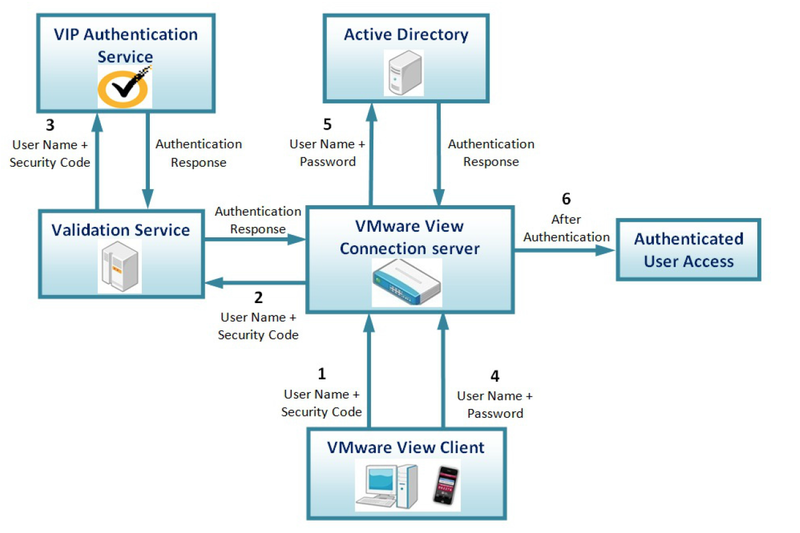 For the script to work it needs to be a user with administrator rights to the Horizon environment. With the creds now in hand you can authenticate to the Horizon API and copy the global extension data to a variable for later use. 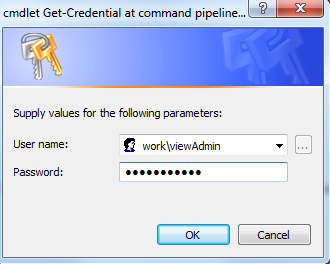 Now you can access the View LDAP directory using New-PSDrive and the Active Directory provider. We're going to provide it the name of our connection server and "ou=Servers,DC=vdi, DC=vmware, DC=int" as the root. With the new PSDrive created you can navigate your way into the directory with a simple CD command. With a successful connection to the View API and View LDAP directory you can start having some fun. First, you can leverage the Get-HVFarmSummary advanced function to get the farm ID of the farm you wish to monitor. 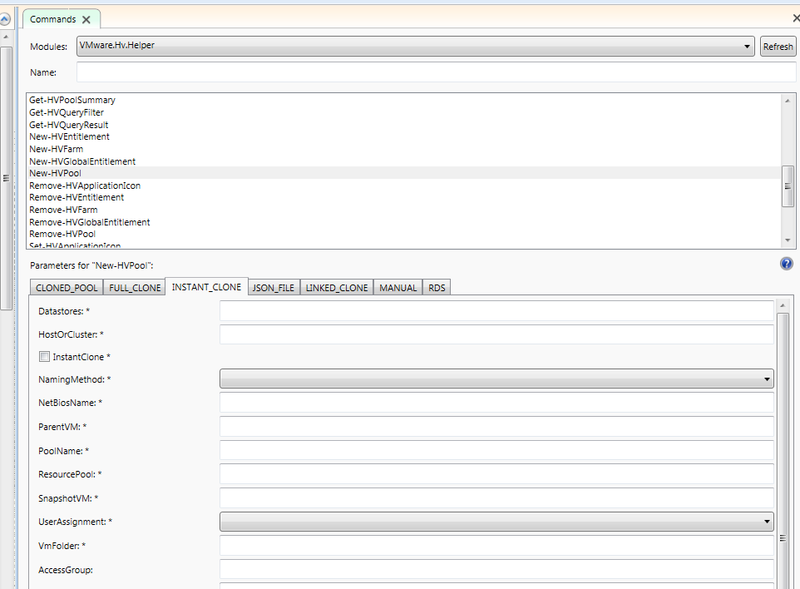 You're then going to use this ID as a parameter for the FarmHealth_Get function associated with the FarmHealth service. To simplify access to this service and it's functions, we'll use the View API Helper library to create an object for it. Then take this new object and feed it the variable for the extension data along with the id for the farm. With $TestFarmHealth you now have a collection of objects representing the RDSH hosts. You can then pull the Name property associated with each one of these objects and perform searches against the View LDAP directory accordingly using Get-ADobject. Each matching directory object found will be appended to the $viewLDAPObjects variable. $target = $RDSHHost.Name + "*"
This is what my farm looks like prior to a new image push. Note that all VMs are using the same Parent VM and snapshot. Now here's what it looks like after a new image push, with 2 systems not updated because users are still logged in. Note the, "scheduled," maintenance status and older snap shots associated with these systems. Here's what the output looks like with an additional server getting updated. 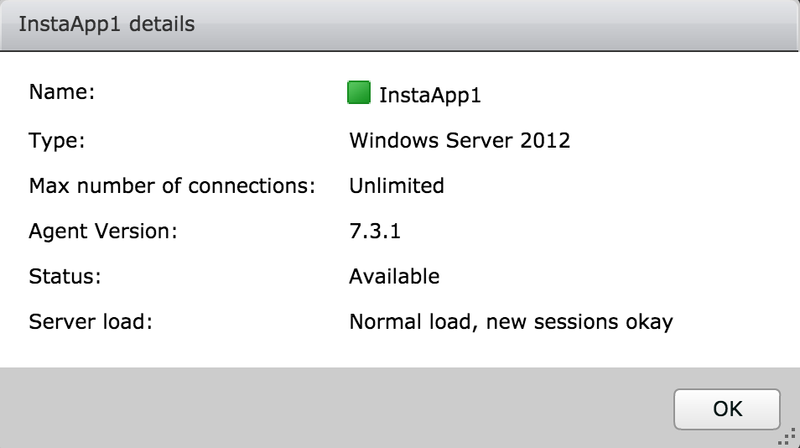 And finally, here's what it looks like after every single VM has been updated with the new image. In a previous post I demonstrated how advanced functions provided by the VMware.Hv.Helper module allow you to create Instant Clone pools with Horizon PowerCLI. Now I'd like to show how to get something done that's not already covered by these functions out of the box. 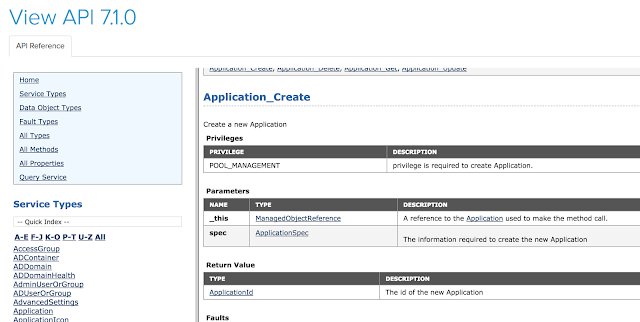 Since the VMware.Hv.Helper module doesn't include any functions for creating application pools I'm going to demonstrate how to create application pools using the ViewAPI documentation and View API Helper library. (The View API Helper library is a wrapper over View APIs that makes life easier for PowerCLI developers.) Looking through service types in the View API documentation I uncovered a service called application with a method called, "Application_Create," that accepts the object ApplicationSpec as an argument. To easily take advantage of this application service and it's methods we use the View API Helper library to create an ApplicationService object as well a ApplicationSpec object that are easy to manipulate in PowerShell. After updating the ApplicationSpec object with properties required for the Application_Create method we'll feed the method this ApplicaitonSpec object. So, to begin with, we'll make a connection to the View API and assign the extension data to an easier to manage variable. Now we can begin populating the properties of this new object with the properties required for the application_create method to execute successfully. $AppPoolSpec.Data.Description = "A pool for calculating "
Finally, we can feed the application service object's method the variable for the global extension data along with the now populated ApplicationSpec object. And, voila! You're application pool is created. Now these were just the bare minimum required properties to make an application pool. We could have specified additional properties such as parameters and start folders. You can discover what's possible by looking at the API documentation. Below is a fast and loose sample script I put together that automates the creation of the farm, pool and entitlement. With Horizon PowerCLI the sky's the limit for folks looking to automate their Horizon 7 environments with PowerShell. Horizon PowerCLI entails leveraging a Horizon 7 module built right into PowerCLI 6.5 R1 and provides Horizon admins with full access to the same View API that's used by the Horizon Administrator console. So, theoretically, any tasks accomplished through the administrator console can now be automated through PowerShell. 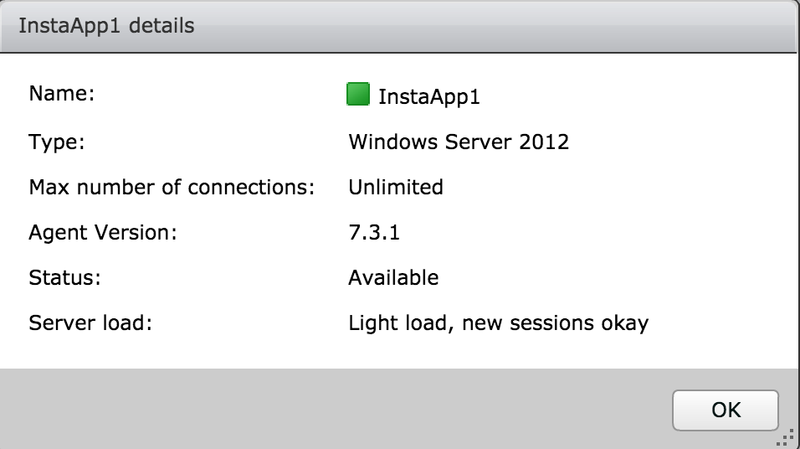 This is a vast improvement over the very limited capabilities of View PowerCLI, which has been officially deprecated as of Horizon 7.0.3. 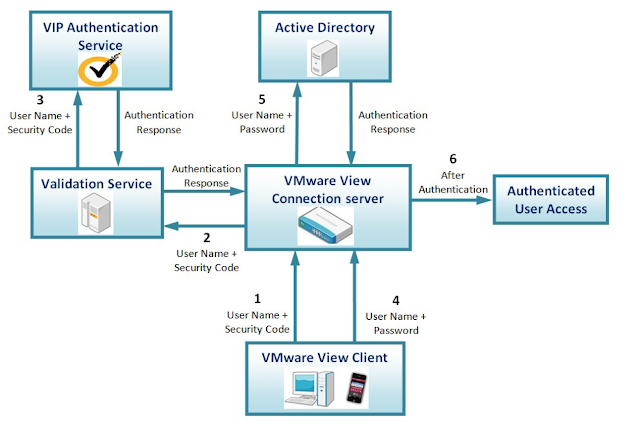 Further, by leveraging the advanced functions developed by the VMware Horizon 7 team, administrators gain simplified and instant access to some of these new PowerShell capabilities. Even better, with a completely documented View API, anything not achievable with these advanced functions out of the box can be achieved with determination and elbow grease. 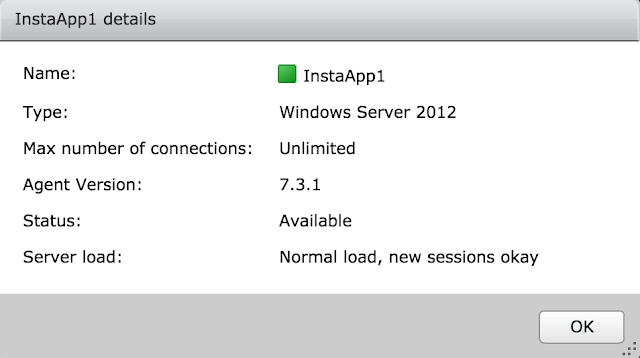 My favorite new capability offered by Horizon PowerCLI is Instant Clone pool management. Using the advanced functions mentioned above I plan to demonstrate how Instant Clone pools can be managed with zero understanding of the View API. Then I'll demonstrate how you can further augment this capability with just a little digging into the View API documentation. The processes detailed below assumes you have PowerCLI 6.5 R1 installed with the Horizon 7 module and VMware.Hv.Helper module imported. For an excellent tutorial on these preliminary steps check out this blog post by Ray Heffer. Once you complete the setup detailed in that post you should be good to go. Below are the result of the function executing successfully. For an explanation of the parameters we provided to New-HVPool, you can use the same old PowerShell help commands you're normally used to running, so commands like help New-HVPool or help New-HVPool -examples will work for you. Also, if you're using the PowerShell ISE, you easily browse and look up parameters for all the VMware.Hv.Helper functions using the commands explorer. When we go back and look at the pool we can see that the image push has been schedule. Using Set-HVPool and the View API documentation, we can compensate for some short comings of the New-HVPool function. After exploring New-HVPool more thoroughly it came to my attention it supports way less parameters for Instant Clones than for Linked Clones. For instance, when using New-HVPool to create an instant clone there's no option for setting a default display protocol or for enabling HTML access. That's okay though. We can look up specific objects and properties within the View API documentation and then use Set-HVPool to update these objects accordingly. To begin with, to get more information about the new Instant Clone pool and what type of object it is, we'll use the Get-HVPool function. We can then use Get-Member to get more information about this pool object type. Based on the output we can see that the pool is of the object type DesktopInfo and that it's properties in turn are other objects. To get more information about this object and it's child objects, we can go to the View API documentation and look it up. This entry for DesktopInfo includes links to the child objects that make up it's properties. Poking around these different objects, I discovered that it's DesktopSettings object contains DisplayProtocolSettings object, which in turn has a property for defaultdisplayprotocol. This certainly looks promising. To confirm the current value of this setting, I can leverage the $MyNewPool object once again. This jives with what I see in the view administrator console. Looking at the View API documentation for the DisplayProtocolSettings object, I can see that possible values for the DefaultDisplayProtocol property are RDP, PCOIP and BLAST. With this info in hand I go on to leverage the Set-HVPool function to change the default protocol. Set-HVPool -PoolName Insta-Gimme -Key "desktopSettings.displayProtocolSettings.defaultDisplayProtocol" -Value "BLAST"
Examples of other pool properties we can set our using Set-HVPool are enabling HTML access or increasing the max number of machines. Note: At least in my own environment, the -Key parameter above is case sensitive, with every member name starting with a lowercase. For example, if I were to try and run the above command with a capital A for the "AutomatedDesktopData" member, I get an error message about an invalid member name. See the example below. The postings on this site are my own and do not represent positions, strategies or opinions of VMware.